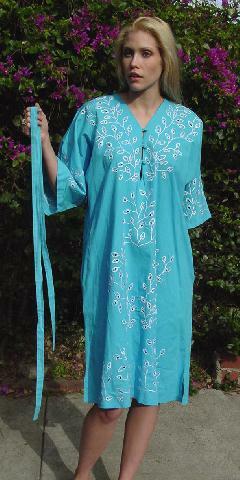 This vintage turquoise 100% cotton dress was made in Mexico. It has a sleeve and front embroidery pattern of flowers and leaves with cutouts in the flowers' centers. It has 3 fabric covered buttons and a 73" long fabric tie belt. 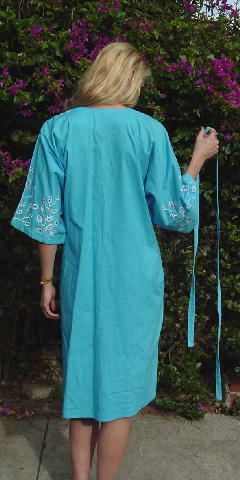 It has 3/4 length sleeves and a V neckline with 3 keyhole openings between buttons. There are 2 side seam pockets and the bottom side seams have 3 3/4" slits. It's from a French model who used it as her wedding dress. She was 8 months pregnant at that time (we didn't ask). She said she wanted an unconventional wedding dress to fit her personality. It was a present from her new mother-in-law (the dress covered "something old", "something new", and "something blue") who had bought it in Mexico circa 1988 and had never worn it. This is a beautiful dress with exquisite detail and a gorgeous vibrant color. neckline to end of sleeve 19 3/4"